The stock Motus is a sport-touring motorcycle, mine is pure chopper. Ever since I've seen Lock Baker starting working on a new project in March or so, I was sure it'll be another cool one. Don't know if you know Lock at Eastern Fabrication (or E-FAB), he builds some pretty badass not-for-everybody choppers. I've been a fan for years... His distinct vision and styling might be influenced by another big passion of his, airplanes. The way he's building his chops is, I my humble opinion, also high-tech aeronautics inspired. True craftmanship in the field. That's why I also posted many videos below, so you can can check the whole build and understand the work that was put into it. And just so you know... the raised up bars ''Club style'' look that is so popular these days on the West Coast and all over the world thanks to Sons Of Anarchy and street Harley stunt hooligans was on Lock's bikes way before it was ''a thing''. And, oh, he also makes some pretty kickass knifes ! But let's stay on the subject... When contacted to find out and learn more about his project, little did I know that Lock will share with me all the ''dirt'' about his latest. So enjoy. The Motus project, aka "Red Asphalt", has been a 3 year build. As soon as I heard Motus was selling their "baby block" V4 as a crate motor, I was all over it. A little background on Motus first... They are an all American motorcycle company based in Birmingham, AL. They have developed a completely proprietary engine, loosely based on small-block corvette engine geometry. What that translates to is a 100", 4 cylinder, big bore/short stroke, pushrod operated, single cam, all aluminum, liquid cooled beast. 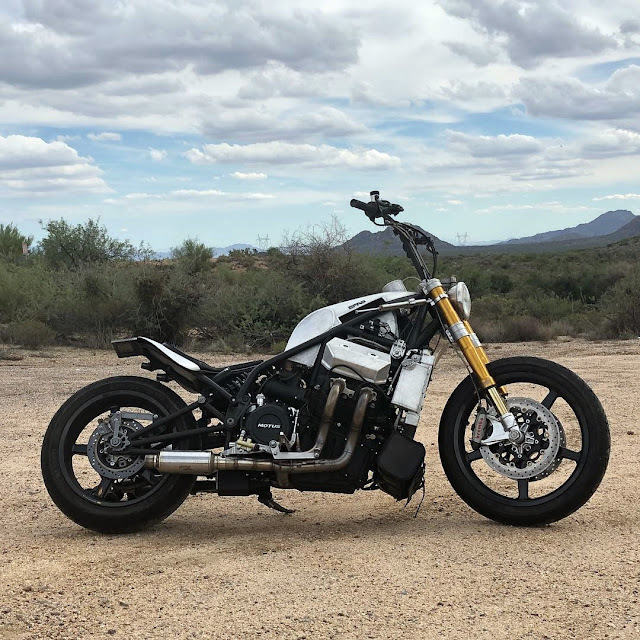 The motor makes 180 horsepower and 126 foot pounds of torque, while weighing in at the same weight as a harley twin cam (weighted as a complete powertrain, motor, induction, primary trans and starter). 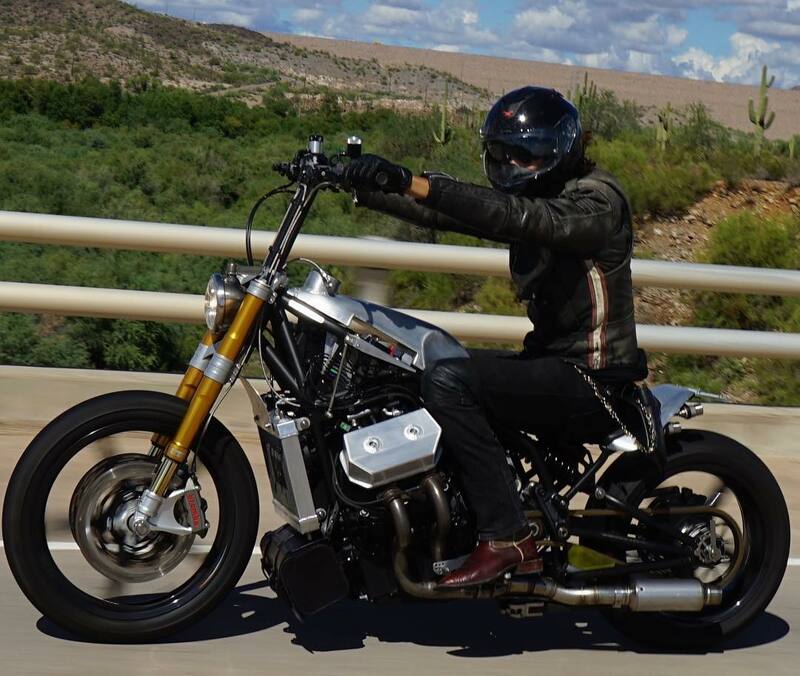 The stock Motus is a sport-touring motorcycle, mine is pure chopper. I built the new chassis, wrapping it around the engine. 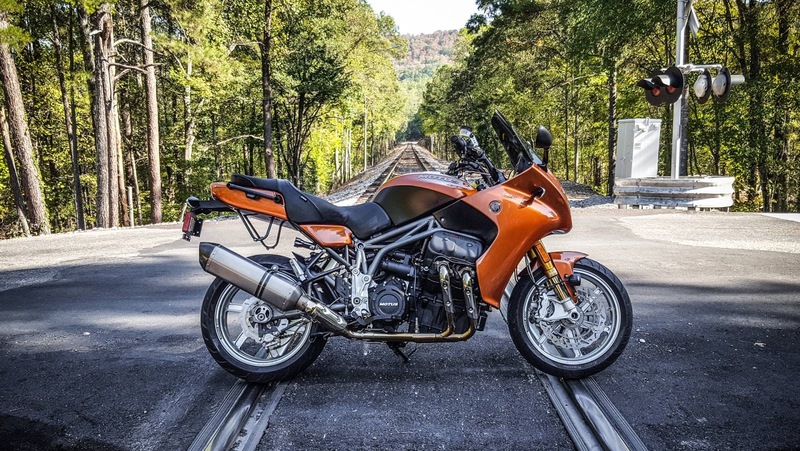 It differs significantly from the stock Motus frame, in that it is much smaller and lighter. My bike has a much lower center of gravity and a short tail section not designed for bags or a passenger, just the pilot. The fuel tank, valve covers and tail section are hand formed 6061 aluminum. Radiator is also a custom made unit, to better fit the look of this bike. Fork legs are Ohlins, as are the twin "vincent style" rear shocks. The fork clamps are proprietary Efab units adjusted to the new rake and head tube geometry. Wheels are featherweight BST carbon fiber, 17" in back and 19" up front. Brakes are Brembos. Wet weight is under 500 pounds. Top speed with stock gearing is 168 mph. Used a ton of titanium on this build; both axles, shock shafts, and spacers and even the taillights are machined from it. Seat is a typical Efab chopper saddle, made from my go-to material, 14 oz cowhide hand stitched. The exhaust system is entirely made from 321 stainless steel, welded without filler metal. It is a 4 into 2 system with a crossover tube. The foot pegs and controls are actually exhaust mounted, but in a way that isolates them from excessive heat. The electronics on the bike are minimal, with the exception of an engine-management ECU, controlled via the left side dash panel. Don't worry though, this computer doesn't limit your riding experience at all. 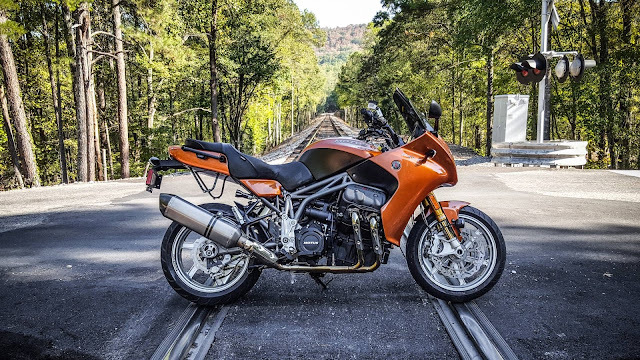 There are no bank-angle, traction control, anti-wheelie, or annoying kickstand sensors to gum you up, just simple air/fuel and temp controls here. No doubt this is a completely modern motorcycle, but it is also a chopper, pure and simple like I always build. Want to make absolute fools out of your riding buddies? Apply at Eastern Fabrications. Many thanks to Lock for taking the time to go over the fab details and all. It's been a treat and a privilege to share Red Asphalt's story on dWrenched. An why that name you ask ? For those who don't know the Red Asphalt movies, they are infamous CHP safety films featuring actual accidents. They were graphic and disturbing, but carried in the same time an important message. Don't drink and drive, wear your seatbelt and don't do stupid stuff behind the wheel. They were played in driver's education classes in USA. 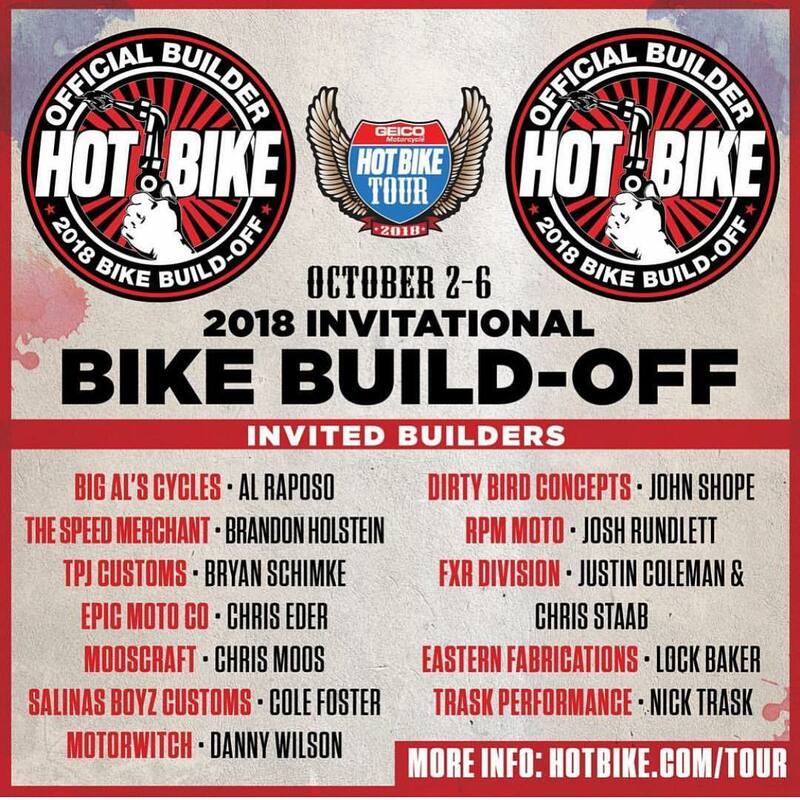 Big congrats to Lock for making it on the cover of the Hot Bike Magazine and for being invited at the Build Off Tour! Many thanks to John Sender for the photos of Red Asphalt in motion.